As of Wednesday afternoon, about 485 families of UND students were registered to take part in Family Weekend activities on campus. Many of those families have snatched up tickets to Fighting Hawks football, hockey and volleyball games slated for this weekend. UND archival image. 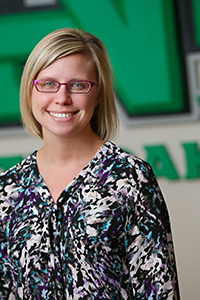 Kristi Okerlund got an early hint that Family Weekend 2018 at UND was going to be another good one. The foreshadowing came in the form of tickets sold for this Saturday night’s hockey tilt between the Fighting Hawks and the Bemidji State Beavers at Ralph Engelstad Arena. The arena had set aside 400 tickets for families of UND students, who planned to be in town for Family Weekend and wanted to purchase tickets for the game. All of those tickets were snatched up as far back as early August. Okerlund said it didn’t stop there. Many of the same folks have gobbled up as many as 1,200 football tickets for UND’s game against the University of Montana Grizzlies, set for 1 p.m., Saturday, at the Alerus Center. 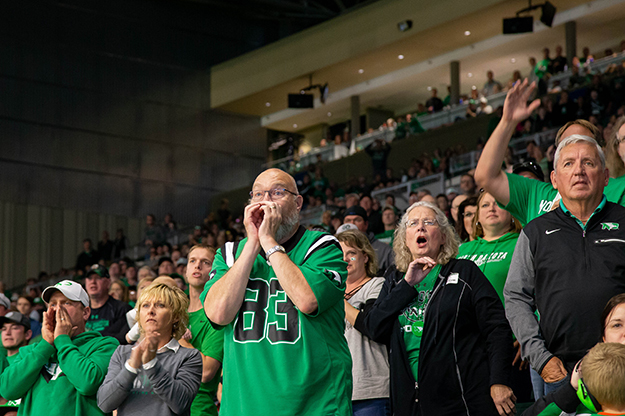 “Some families have purchased up to 10 tickets for that game,” said Okerlund, assistant director of student involvement and parent programs at UND. The rush on football tickets for Family Weekend didn’t go unnoticed by UND head football coach Kyle “Bubba” Schweigert, who sent Okerlund a handwritten card thanking her for her role in the surge and exclaiming how great the game will be with all the support from the family members. Also this weekend, Fighting Hawks Volleyball, which has averaged around 1,000 fans per game at home this season, can expect an extra 100 or so, thanks to the Family Weekend crowd, as they take on the University of South Dakota Coyotes at 2 p.m. Sunday in the Betty Engelstad Sioux Center. 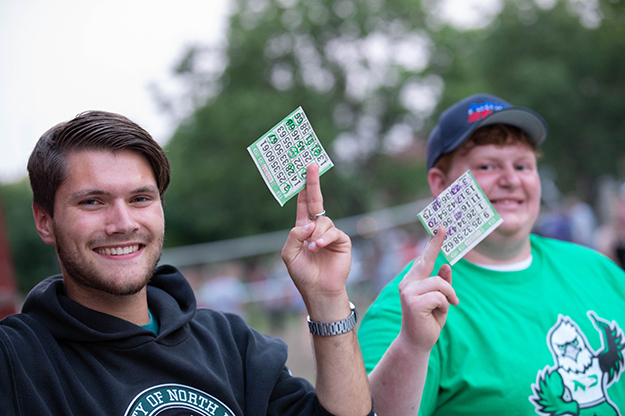 Friday night Bingo is a traditional hit among UND students and their families during Family Weekends on campus. Photo by Jackie Lorentz/UND Today. Okerlund said that as of Wednesday afternoon, there were 485 families registered to be on campus for Family Weekend Activities. She said that’s about the same number that registered for last year’s big Family Weekend. A more exact count of how many individuals make up all those families is harder to come by, she said. Each family could reflect one person or many more. 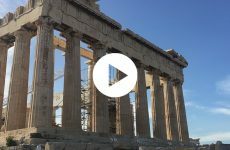 Apart from the sporting events, campus tours are scheduled throughout the weekend. Check out the full weekend schedule. And Friday night Bingo is always a hit on Family Weekends. This year’s rendition starts at 8 p.m., in the Memorial Union Ballroom. Saturday morning brings a special “Parents’ Orientation 2.0,” set for 8:30 a.m., in the Memorial Union’s Loading Dock area. There parents will be able to interact with various UND staff members, such as Orlynn Rosaasen, director of dining services, Connie Frazier, executive director of student housing/dining, Cassie Gerhardt, associate dean of students; Alex Pokornowski, assistant dean of students; and Eric Plummer, associate vice president of public safety and chief of police. Later, at 9:30 a.m., a wood sign-painting class will commence in the Memorial Union Ballroom. Master sign maker Bethany Bratlie will be on hand to walk participants through every step of the process of making decorative wood signs with fun stenciled messages, such as “Today is a good day for a good day,” and “Sundays are for football” and a multitude of other ideas. 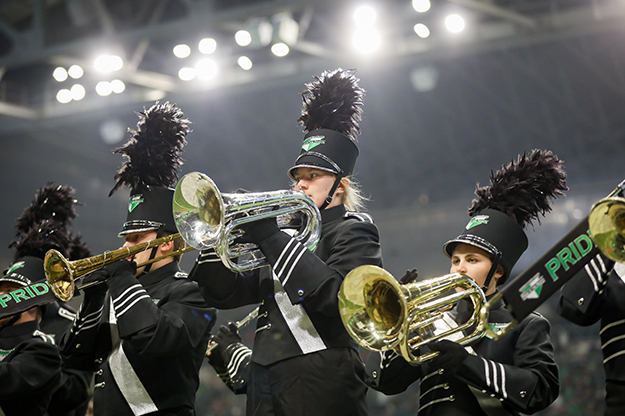 As part of Family Weekend 2018, loved ones of UND’s Pride of the North Marching Band members will get to celebrate their favorite musicians before Saturday’s big Fighting Hawks football game against the University of Montana Grizzlies at the Alerus Center. Photo by Shawna Schill/UND Today. Saturday also is Family Day for the UND Pride of the North Marching Band, who will be a big part of the UND sports contests that take place over the weekend. It all starts at 9 a.m., at the Alerus Center, where families will get a photo taken with their special band members, and lunch will be served. Okerlund said the Family Weekend Check-in hub will be in the Student Involvement Office on the main floor of the Memorial Union. There will be snacks and beverages available, along with campus maps and several giveaway items. For all your up-to-date information, check out the UND Family Weekend website.